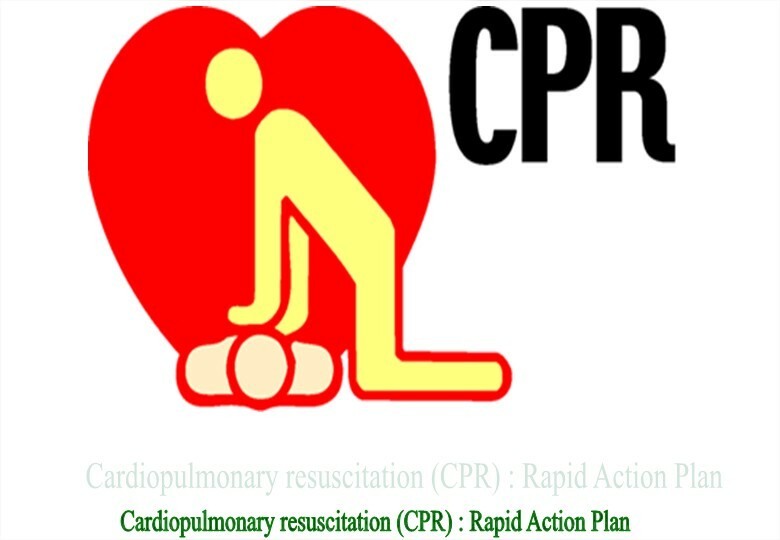 CPR (Cardiopulmonary resuscitation) is the union of mouth to mouth rescue breathing and cheast compressions. It is a life saving technique useful for many emergencies, including heart attack or near drowning, helps to retain oxygen and blood circulating to the brain and heart of a person whose heart become stopped breathing .It is a conclusive medical treatment and can restore normal heart and ventilatory action. CPR is a combination of Rescue breathing (provides oxygen to a person's lungs ) and Chest compressions(keep the person's blood circulating) . A cardiac arrest can be caused by many things and causes tend to differ from adults to children. A (Airway)- Ensure open airway by prevention the falling back of tongue, tracheal intubation if possible. B (Breathing) – Start artificial ventilation of lung. C (Circulation) – Restore the circulation by external cardiac massage. D (Differentiation, drug, defibrillation) – Quickly perform differential diagnosis of cardiac arrest; use different medication and electric defibrillation in case of ventricular fibrillation. The air we breathe in, travels to lungs were oxygen is picked up by blood and then pumped by the heart to tissue and organs. When a person experiences cardiac arrest due to heart failure in adults or the elderly or an injury such as near drowning ,or severe trauma, the heart goes from a normal arrhythmic pattern called ventricular fibrillation.This prevents the circulation of oxygen throughout the body and rapidly killing cells and tissue. Inessence, cardio (heart) pulmonary(lung)resuscitation (CPR)serves as an artificial heartbeat and an artificial respirator. CPR may not save the victim even performed properly, but if started within four minute of cardiac arrest and the defibrillation is provided within 10 minutes, person has a 40% chance of survival. Adrenaline : The recommended dose is 1mg in each 3-5mint. Vasopressin : In some cases 40U can replace replace adrenaline. Lidocain : Should be used only in ventricular fibrillation. Generally, Cardiopulmonary resuscitation is stopped when the person is revived and starts breathing , medical help such as ambulance paramedics arrive to take over or the person performing the CPR is forced to stop from physical exhaustion. Cardiopulmonary resuscitation ; From Wikipedia, the free encyclopedia. CPR Cardiopulmonary resuscitation for Heart health information. CPR Overview from American Heart Association Guidelines for Cardiopulmonary Resuscitation and Emergency Cardiovascular Care by Andrew H. Travers, Co-Chair. Register for information and advice. We'll help you find out everything. Whether you're looking for a doctor for dealing with your own medical condition, click here to find right physician. It is any effect of a drug, chemical, or other medicine that is in addition to its intended effect, especially an effect that is harmful or unpleasant. Copyright © 2015 Meds Plan.com. All rights reserved.